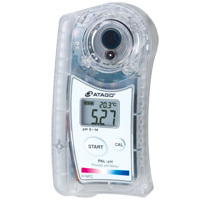 pH Meter | ATAGO CO.,LTD. 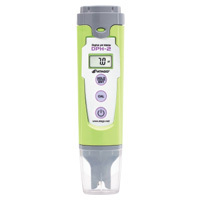 Pocket pH meter is very new which is droplet type pH meter. It only needs simple operation by a small amount of sample. It can be used widely from food and beverage such as soil, water-soluble cutting oil, alkaline cleaning liquid. Calibration at 3 points at 4.01, 6.86, 9.18. ATAGO is proud to introduce our new digital pH meter, DPH-2. Like all ATAGO products, the DPH-2 is extremely easy to use. It has a compact, portable design and is water resistant (IP67), so it can be cleaned under running water and submersed into water without any negative effects. It has an Automatic Temperature Compensation mechanism that function from 0 to 50°C. With these features, the DPH-2 is perfect for many different applications including food and beverage production control, brewing and fermentation, soil and hydroponics, cutting oils, alkali washing liquids, and other soluble solutions. Great Features at Great Price. *Calibrate at 3 points (4.0, 7.0 and 10.0). (C) 2003- ATAGO CO.,LTD. All rights reserved.